If you like your romances with a seasonal touch, it’s the time of year to read romance fiction that features witches and ghosts and things that go bump in the night. I’m not much of a paranormal reader, but I do have a few favorites that might be termed paranormal light. Breath of Magic ranks high in that group. I reread it not just at Halloween but also at other times when I need a romance that makes me laugh. Arian Whitewood was sent by her ailing grandmother to live with her mother and stepfather in colonial Massachusetts. Arian’s mother died before Arian arrived, and her stepfather, who sincerely loved his wife and promised to care for her daughter, has struggled vainly for a decade to turn his white witch stepdaughter into a proper Puritan. Arian tries to cooperate with his efforts, but her supernatural abilities cannot be contained. When her stepfather asks for help from a minister, the result is a witch trial that concludes with Arian undergoing the water ordeal. Fearing that she is about to die, Arian casts a spell that goes awry, sending her, her emerald amulet, and her broomstick from Gloucester in 1689 to New York City in 1996. Eccentric tycoon Tristan Lennox has cynically promised one million dollars to anyone who can prove the existence of magic outside the parameters of science. 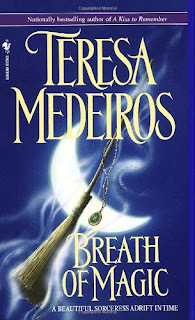 When a broomstick-riding Arian, dodging helicopters, lands in the courtyard of Lenox Tower where the magic contest is being conducted, Tristan is convinced she is a fraud. Feeling the need to keep an eye on her, he houses her in his penthouse apartment while his team of experts examines Arian’s broom to determine how it flew. Tristan, jaded and distrustful of almost everyone, is suspicious of Arian, angry with the chaos that she creates, and reluctantly intrigued by her. Arian is learning to use her own gifts and adjusting to life in a world that seems to her to be filled with unimaginable wonders and fearsome dragons. Tristan eventually learns to trust Arian and his feelings for her, but the two must survive many dangers before they can claim their HEA. To enjoy this novel fully, you must be willing to suspend disbelief and accept this story as you would a fairy tale. If you can do this, you will be charmed by the effervescent Arian and gradually won over by the wounded loner Tristan. I adored them both. The secondary characters are also deftly drawn. The villains are appropriately heinous, Sven, Tristan’s bodyguard, and Michael Copperfield, Tristan’s Native American best friend and legal adviser, are scene-stealers. There is adventure and mystery in the plot, but it is the humor that makes the book special for me. Arian’s encounters with twentieth century plumbing and her first shopping trip to Bloomingdale’s are laugh-out-loud funny. They are among my favorite funny scenes ever even though I generally prefer more cerebral humor. If you are looking for a bewitching romance to read for Halloween, I highly recommend Breath of Magic. The sequel, Touch of Enchantment in which Arian and Tristan’s genius daughter travels to the 13th century, is almost as good. Another delightful bit-of-witchery romance is Jill Barnett’s Bewitching, with one of the best epilogues in romance fiction. Why not make one of them—or all of them—part of your Halloween celebration? Do you have a favorite witchy or ghostly romance? I am going to have to check this out immediately! I have gotten to the point now that I have so many "favorite" authors I can't keep up with all of their writings. Thanks for the review I had no idea this was even out there. Breath of Magic was first published in 1996 but it's stood the test of time. Hope you enjoy it! It's a good exception, Bridget! Oh I really enjoyed this. I guess it's time to reread. : Thank you for reminding me about Breath of Magic . Hope you enjoy it just as much on the re-read! I've not read it but I'm sure it's something I would enjoy. Hope you like it, catslady! I thought I have read everything by Theresa but I missed this one. Will have to check this out. Thanks for the heads up.